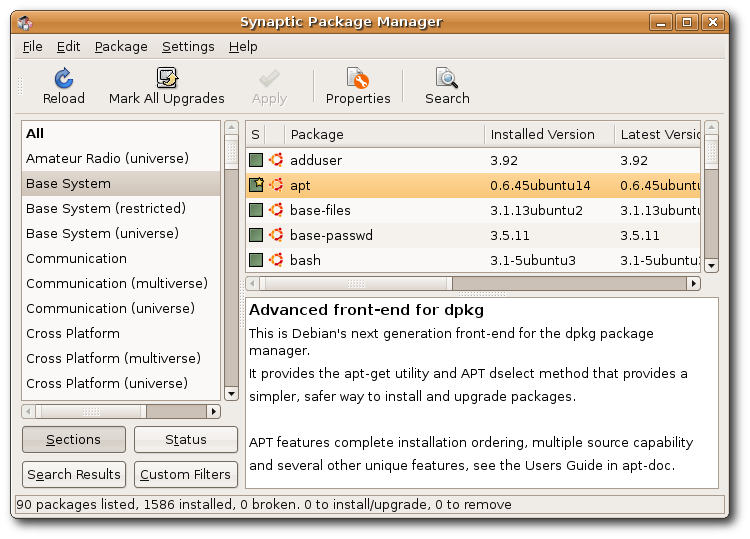 Ubuntu can be updated or upgraded from synaptic manager or command line. Update or upgrade can also be done through Update manager. 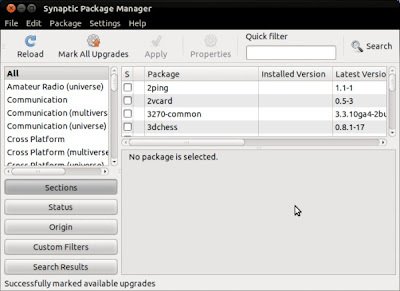 To update/upgrade Ubuntu open Synaptic manager : In the synaptic manager select the reload option and it will download Ubuntu update files. After the download completes, select the option Mark all upgrades. Then another window will appear, select the Mark option and then after click on Apply option in synaptic manager. 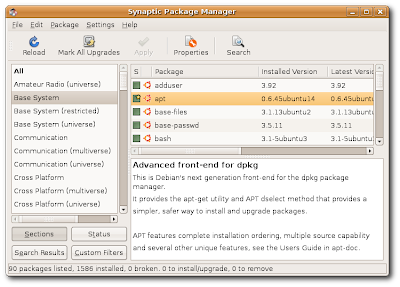 Synaptic manager to update Ubuntu. To update or upgrade through Update Manager : Open the Update manager and select the option ‘Check’. It will check for the latest Ubuntu software and latest Ubuntu version. After that select the option Install Updates. If the new version of Ubuntu is released then there will be an option which will say “Upgrade Ubuntu to latest version”. To update or upgrade from Ubuntu command line : Type the following commands in the terminal. 1. Insert the Tata photon plus in USB port. 2. Click on the Network manager icon and select “Edit connections“. 3. Go to “Mobile broadband” tab and click on the Add button. 3. If the wizard shows you the name of the detected device, then bingo! Otherwise, you might need to take some extra measures to make that happen. If the Tata photon+ is not detected then go to terminal and type the following command. If the problem still exists then do post your queries as comments below. With the arrival of Unity in Ubuntu 11.04 and above, compiz is outdated and to make Ubuntu desktop fill with snow you have to use another software. 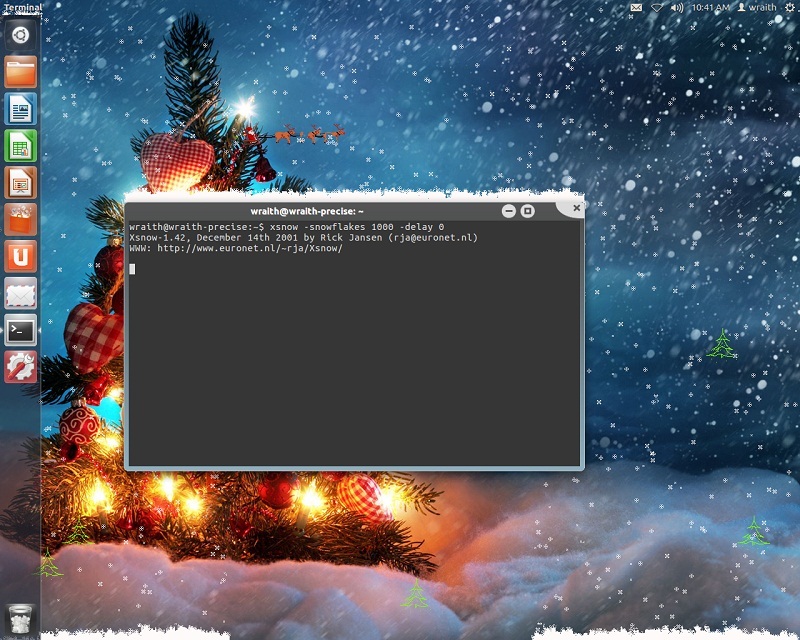 There exists a small window called Xsnow to bring snow to your desktop and create a Christmas scene. After installation, run xsnow in a terminal by typing the following command. Default number of snowflakes is 100 and max is 1000. It can be changed by option -snowflakes. Default delay after updating everything is 50 ms, it can be changed by option -delay. For example, the command below uses the maximum number of snowflakes and running as fast as possible. Default Ubuntu force quit option is not present in Ubuntu 11.10 and with other Unity versions. To add force quit option to Ubuntu in Unity you need a different approach. There is a script which needs to be run to get Force quit option in Unity. After running the script again you can add force quit button in Unity, using which you can stop a non responding application. 1. Extract the file from the tar format. 2. In the extracted folder look for install.sh. Run the file by double clicking or running through command line. 3. Enter the password, then a nautilus folder will appear showing different shortcuts. Select the Ubuntu force quit icon shortcut and drag it to Unity launcher and you are done. Here are 13 Ubuntu tips and tricks for you. Tips that will make your Ubuntu experience awesome. These tips are in my point of view. If some one wants to post their own tips and tricks, then just comment..
1. Play or Stream YouTube videos directly in Totem Movie Player : Open Movie Player, go to Edit -> Plugins and enable YouTube Browser. In the right panel, select YouTube. Now you can search for videos. It runs in full screen too. Install the video player Totem youtube plugin for H.264 for better quality. 2. By holding the mouse over the audio files you can play that file as an overview. 3. One thing that bothered me when I first installed Ubuntu was the size of the icons – large they were! So if this is the case with you as well, then, open nautilus and go to Edit -> Preferences: Display icons: the default zoom level: 75%. 4. To customize the colors in your Ubuntu, install sudo apt-get install gnome-color-chooser which you can then find under System –> Preferences. $sudo apt-get install alltrayIt allows you to open a program in the system tray, even if the software does not support. To do this – hit alt + F2 and type: <name_of_software_to_open> alltray and the same goes for shortcuts. and to convert avi: ffmpeg-i example.flv example.avi(change the name of the video as per your wish and the link to the youtube video you want to download). $mencoder-idx-ovc lavc example.ogg-nosound-o example.avi (that is if the file does not ogg sound). 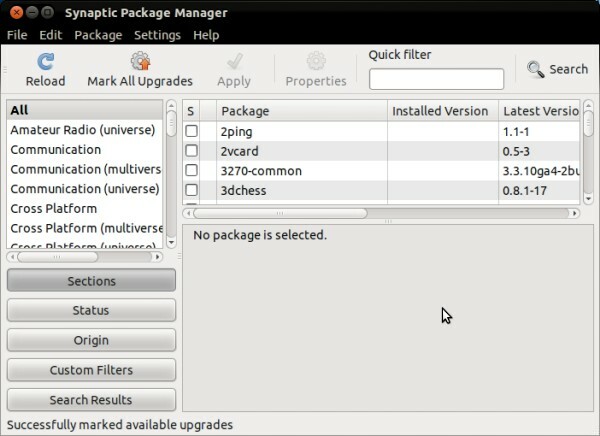 Synaptic manager is no longer pre installed in Ubuntu 11.10 and other higher versions of Ubuntu. At first sight, it might look like missing or a faulty Ubuntu installation but it can be installed in simple steps.